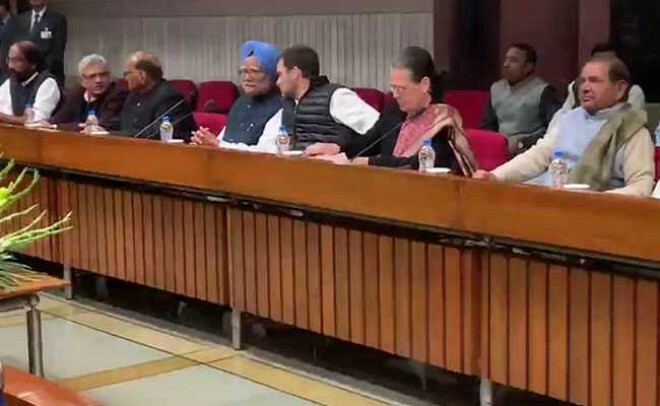 New Delhi, Feb 27: Senior leaders of 21 opposition parties who met in Parliament today said they backed the Armed Forces and expressed deep concern for the air force pilot who went missing during this morning's engagement with Pakistani Air Force. But there was sharp criticism for the "leaders of the ruling party" for the politicization of the "sacrifices of the Armed Forces" - a veiled reference to Prime Minister Narendra Modi, who sharply criticized the Congress at a government function earlier this week. The opposition parties also pointed out that the government has failed to take them into confidence - a convention in such circumstances. In a statement released at the end of the meeting, the opposition said, "The PM has, regrettably, not convened an all-party meeting as per the established practice in our democracy". The leaders, the statement said, "urged the government to take the nation into confidence on all measures to protect India's sovereignty, unity and integrity". A resolution, however, was passed which said the opposition will stand with the country and against the enemy at this moment. The Opposition meeting at the parliament came this afternoon following the escalation in hostilities with Pakistan since yesterday's airstrikes on a Jaish-e Mohammad terror camp in Balakot. Today, Pakistani Air Force, while attempting to target Indian military installations, was engaged by the IAF. While one Pakistani F-16 aircraft was shot down, India lost a plane, the pilot was declared "missing in action".